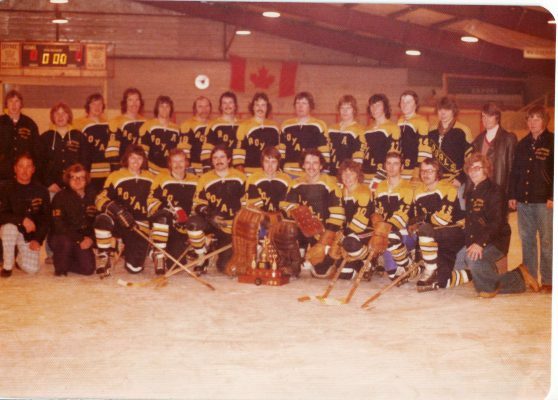 The Deloraine Royals of the 1970's were a small town team that had a big impact on hockey in Southwest Manitoba. The Royals won six straight championships in the Southwest Hockey League on an amazing run from 1972-1979. In the 1975-76 season, the Royals entered the Manitoba Intermediate âAâ playoffs and quickly dispatched the St. Boniface Riels in the opening round. This earned the high-scoring Royals a date in the provincial final with the powerful Warroad Lakers. After losing the opening game of the best-of-three series 6-3, the Royals came from behind in the last 10 minutes of game two to force a deciding game three. In front of a capacity crowd at Deloraine's Winchester Arena , the Royals took the Manitoba Intermediate âAâ championship with a 6-3 victory. Advancing to take on Belcarres Broncos in the inter-provincial Manitoba-Saskatchewan competition. Winning game one 7-5, the Royals battled back to win game two and the title with a 5-2 victory. Not quite done yet, the Royals returned home to knock off the Minnedosa Bombers for another SWHL championship.